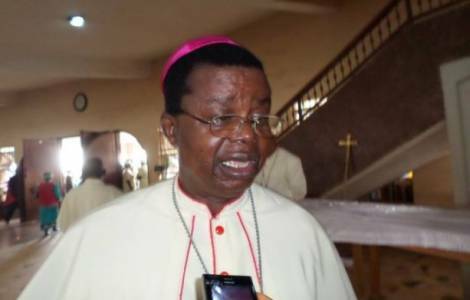 AFRICA/NIGERIA - Postponement of the vote; a Bishop: "Let us put aside controversies and support those who must ensure credible elections"
Abuja (Agenzia Fides) - "The electoral process is managed by human beings and there may be errors, so let us stop complaining" said His Exc. Mgr. Paulinus Chukwuemeka Ezeokafor, Bishop of Awka, who urged Nigerians to stop finding those who are responsible for the postponement of the general elections that had to be held on Saturday 16 February but were postponed, a few hours after the scheduled opening of the polls, to the following Saturday, 23 February. Mahmood Yakubu, President of the Independent Electoral Commission (INEC) assumed the "full responsibility" of the logistical delay on the preparation of the elections, stating that organizing the vote in a Country whose infrastructure is lacking or in ruins is "a huge challenge". Despite the assumption of responsibility by the President of INEC, the postponement of the vote has provoked strong protests from the population, especially those who had returned to their country of origin to vote. The gesture of Mahmood Yakubu was praised by Archbishop Ezeokafor who urged Nigerians to support INEC’s action to have free, fair and credible elections". "Nigerians must have faith in INEC because it is the only body able to allow us to choose our leaders". The decision by the Electoral Commission to divide the vote into two phases is also increasing discontent. While the presidential and parliamentary elections will be held on 23 February, those for the election of governors have been postponed from 2 to 9 March, raising strong controversy over the cost of the vote.